The design tab allows you to customize the look and feel of the checkout theme. The settings are divided into two groups, Global Settings and Theme Specific Settings. Setting a logo is optional. If you do not provide a logo, we will use your site name (found under Settings -> General). By default, a standard copyright notice is displayed in the footer. If you would like to customize this text, you can enter your own text in the Footer Text WYSIWYG. Controls the background color of the header. Controls the color of text in the header. Controls the background color of the footer. 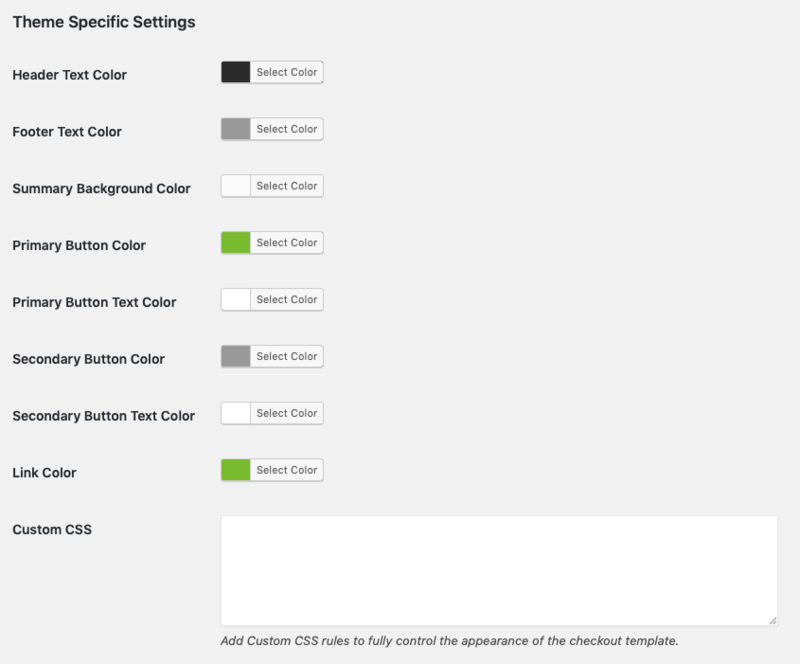 Controls the background color of the right pane for supporting themes such as Copify. Controls the background color of primary buttons, such as the navigation buttons that navigate between tabs. Controls the text color of primary buttons. Controls the background color of secondary buttons, such as the button that applies coupon codes. Controls the text color of secondary buttons. Controls the color of hyperlinks. You can enter custom CSS styles in the Custom CSS text box. CSS can be directly entered, meaning you do not have to wrap styles in a <style> tag.